Despite the poor weather on the day, I arrived at the Church to be greeted by John Cade, Tower captain of Grimsby Minster and arranged with him to meet the priest and set about the final preparations for the service and the meeting. John unlocked the tower and waited to commence the ringing. We had the pleasure of welcoming several visiting ringers, Sue Faull and Chris Turner from the West Lindsey Branch and we had visiting ringers from Chelmsford in Essex who made the ringing. There was plenty of variety in the ringing and the standard was good, ringing was varied to suit the individual needs of people wishing to ring, and ranged from rounds and call changes to Little Bob Royal. Grandsire Triples and Caters were rung, Plain bob on varying numbers and Cambridge Surprise Minor. It was then time for the service, the Organist Roger Lord played some entry music while everyone was taking their seats and the Green service book was used. 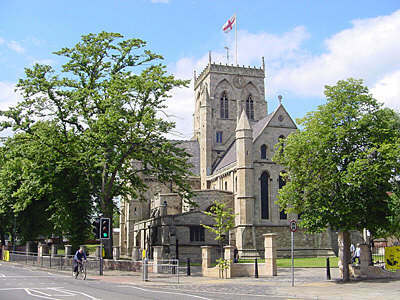 The service was led by one of the team priests at Grimsby Minster, Revd Katherine and made the congregation welcome. The address focused mainly on the importance of ringing to call to worship and was a general thanks to all that turn up to call people to worship within the church. Hymn�s that were sung were O God, who madest time and space, Unchanging God, Who livest and Glad bells ring loud and clear, all from the Guild Service book. After the service, it was time for tea, this was laid out in the back of the Church, refreshments were provided, my thanks must go to John Cade, Angela Newson, Sarah Newson and David Newson for stepping in at short notice to be able to serve these, and it was appreciated by all who attended. Joy Lord, as always was selling raffle tickets, and our Branch Treasurer Roger Lord was in a corner taking money for subscriptions!! After the tea, Linda Bromfield, the Branch president called the meeting to order to begin the business meeting. It was fairly well represented by members of the Northern Branch, and of course our visitors from neighbouring branches and of course counties!! The agenda was followed. Reports time, Andrew Lord, Northern Branch ringing master gave his report firstly by thanking towers who had hosted meetings in the previous year, and highlighted that we had a very successful joint branch meeting with the Eastern Branch with afternoon and evening ringing. Andrew continued through his report and congratulated all members that had made an achievement in ringing in the branch the previous year and hoped that the success would continue. Andrew then went on to award the Alan Hewitt shield to the tower that has made a significant improvement over the past year. 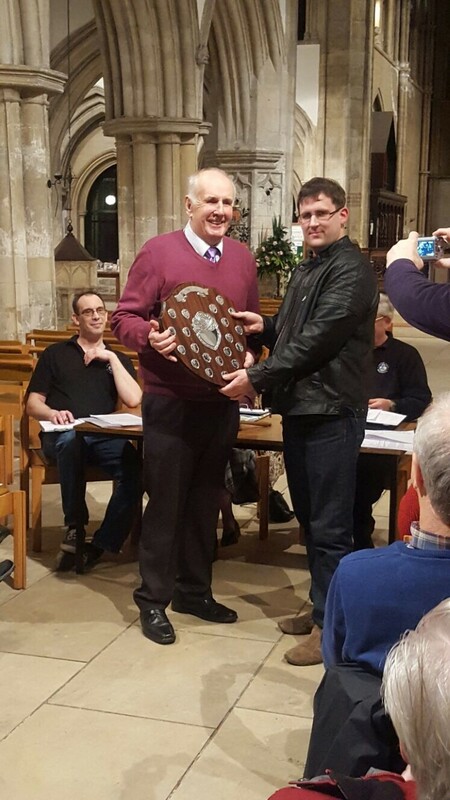 This year, the Shield was presented to Grimsby Minster. This tower started the year with no ringing, no tower captain and very few ringers. 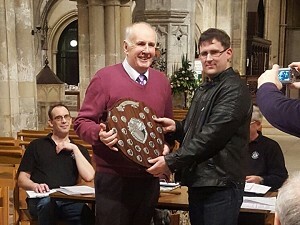 Andrew then asked John Cade to receive the trophy on behalf of all the ringers at Grimsby. Discussions took place on upcoming branch events, and also about another joint practice with the Eastern Branch which appeared to a popular idea of all present. Linda then after the discussions closed the meeting thanking everyone that was present for turning up, Grimsby for hosting the AGM and providing the tea.